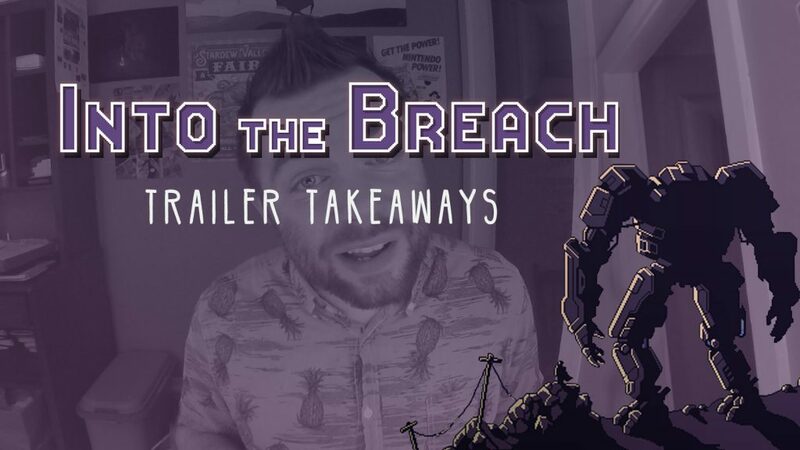 Video: What makes the ‘Into the Breach’ trailer Damn Near Perfect? Into The Breach — it might be a little while until this game comes out. But I’m chomping at the bit. Why? It’s trailer is Damn-Near-Perfect. Here are some takeaways for your own announcement trailers — especially if you’re making a tactics game. Anybody who plays tactics games knows most of the game is sitting there thinking about what to do. Don’t show that! But do show the fast-breaking action. Make us feel these hits connect — as fast as possible! If your game’s objective isn’t clear. Try telling them. You can always pare-back if it’s too hammy. See how the city is under attack by kaiju and the big robots arrive with the, “Protect the city?” This establishes the objective for the player. A little bit of context is all the viewer needs to see themselves in the game. If you’ve got experience, show it, but highlight your new hotness. 4. Use some swirly-twirly camera focus! It’s your job to make sure folks only see what you want them to see. When your game has a really-busy heads-up display, you gotta snag the camera control, zoom-in, get in there, keep the camera moving along. Drive their eyes. I don’t know any other tactics games that involve time travel, at least not off the top of my head. This line right here: “If you really can go back in time, do it now?” That’s fancy! Highlight, underline, ALL-CAPS that stuff! Be unique. I’m M. Joshua. Find me at mjoshua.com. And? Feel free to subscribe — for the next time we look at a damn-near-perfect trailer.